Really nice picture. Beautifully detailed and richly resolved. Beautiful colors. Is the prominent bluish star at 4 o'clock Alpha Circini? And is the prominent bluish star near the bottom right corner Beta Triangulum Australis? Is the bluish double star to the upper left of Sandqvist 169 Delta Circini and friend? This is interesting. If it wasn't for the 'us' the names Kentaurus and Centauri almost rhymes. It would even be closer if you pronounced the C as a hard C like in the words cat, candle or Canada. I've always pronounced Centauri with a soft C as in cent, city, or celebrity. Which makes me wonder, how is Centauri officially pronounced? Hard C or soft C? Both names stem from the mythical centaur. It is likely spoken with a hard k sound in Greek and a hard q sound in Arabic, but with a soft c in Latin and English. Thanks for featuring my image as APOD! <<Where's Wally?, published in the United States and Canada as Where's Waldo?, is the title of the first book in the Where's Wally? series, published in 1987. In the book, Wally travels to everyday places, where he sends postcards to the reader (which are the pictures in the book), and the reader must locate Wally in the postcard. The book became an instant best-seller. Where's Wally? was re-released in October 1997 in a special 10th anniversary edition form. The location of Wally was changed in each picture and additional characters were added for the reader to find (Woof, Wizard Whitebeard, Wenda, Odlaw, the Wally Watchers, and others). The Wally series is quite evocative of an earlier children's book titled Where's Wallace? (by Hilary Knight), in which a red-headed orangutan escapes from the zoo and "hides" in highly detailed picture panoramas, including beach, department store, circus, stadium, and museum. Proxima Centauri is terribly hard to find. 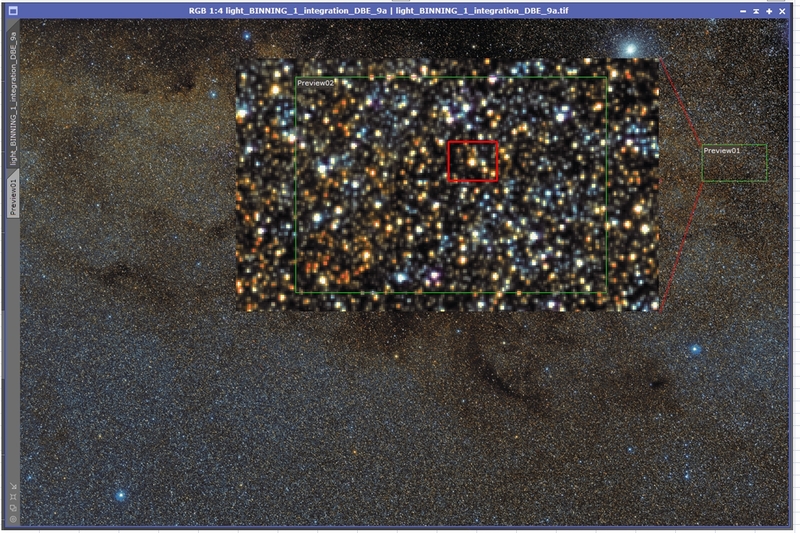 I think I can see a line of 10th and 11th magnitude stars relatively close to Proxima Centauri in the pictures I posted, anchored by 8th magnitude star HD 126793. I'm not sure I can see that line of stars in your closeup. Maybe possibly maybe the star that you have pointed out as Proxima Centauri could in fact be HD 126793. OH, wait!!! I think I can see that line of stars in your closeup!! Yes, I think you may have found Proxima!!! Wow! The dust clouds are dark; but sprinkled with a lot of small stars; so many in fact that the clouds look similar to sandpaper! I agree on the ID. Here is a 2014 image I did with a remote telescope (field about 10 arcminutes), where the ID was confirmed by the motion year-to-year (and huge change since the digitized Sky Survey photographs). Comparison shows its proper motion from 2014 to your image, as well. It sure looks like a long way from Alpha. Alpha, Beta and Proxima Centauri. It is a long way from Alpha indeed! 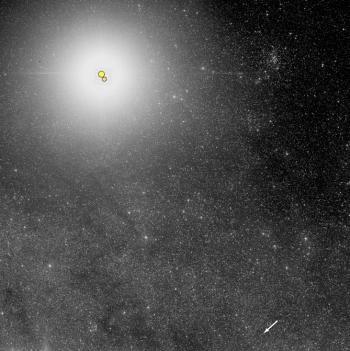 Alpha Centauri has yet another member, a faint eleventh magnitude (11.05) companion called "Proxima" that is a huge 1.85 degrees (at least 8500 AU) away from Alpha proper and that orbits with a period of at least a three-quarters of a million years. If indeed it does orbit (and that is not certain), it is now on the near side of its path and some 6,000 astronomical units closer than the bright pair, making it actually the closest known star (but since it is part of Alpha, surely it is still fair to call Alpha the closest star). Nice image of an obscure region. There is a lot in Circinus for astrophotographers. An interesting coincidence is the Atacama Photographic Observatory team released a closeup of Sandqvist 172 a few days ago. They also have a closeup of Sandqvist 169, which is also known as the Circinus Cloud. Stellarium nicely confirms Proxima's location. Interestingly, the APOD shows Proxima to be about a 30 arcsec westward of Stellarium position. This is consistent with about 9 years of proper motion. I'm using about a 3-yr old version of Stellarium and I don't know how old Proxima's coordinates are. Still, it's likely the obvious position change is, in good part, due to proper motion. Edit: The viewed position difference is purely a prediction error. I've not used Stellarium for measurably fast-moving stars before. The program does attempt to update Proxima's position based on the "year of last satisfactory observation" which is listed as 2000. It's unclear if/when they'll implement GAIA data.